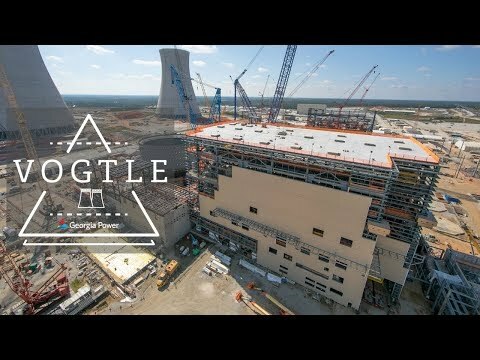 ATLANTA, Dec. 12, 2017 /PRNewswire/ -- 2017 was a year of construction progress for the Vogtle expansion with 6,000 people from across the country onsite working to move the Vogtle nuclear expansion forward. 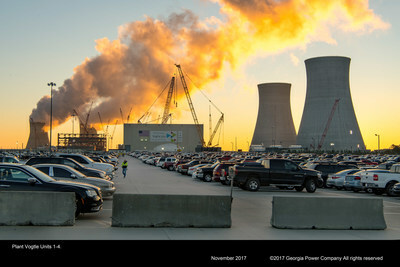 The new units at Plant Vogtle (co-owned by Georgia Power, Oglethorpe Power, MEAG Power and Dalton Utilities) are the only new nuclear units currently under construction in the United States and, once complete, will generate enough electricity to power approximately 500,000 homes and businesses. The first steam generator is placed for Vogtle Unit 3. The 1.4 million-pound steam generator marked the first major lift with Southern Nuclear in charge of oversight activities at the construction site. 6,000 workers from across the country remain onsite working to move the Vogtle expansion forward at the end of 2017. February – The energization of the Unit 4 switchyard. Once the new units are online, the switchyard takes energy from the plant and feeds it onto the power grid to serve customers across the state. March – Westinghouse, the primary contractor for the Vogtle nuclear expansion and designer of the AP1000 technology being used for the new units, files for bankruptcy. Georgia Power and the other co-owners were prepared for this possibility and immediately put an interim assessment agreement (IAA) in place that allowed work to continue at the site. The IAA remained in place throughout the summer, keeping thousands of workers engaged and construction moving forward. At the construction site, 19 new operators pass the initial licensing exam by the Nuclear Regulatory Commission. Once operational, the new units will employ approximately 75 highly trained nuclear operators as part of a permanent workforce of more than 800. May – A new service agreement that allows for the transition of project management from Westinghouse to Southern Nuclear (the Southern Company subsidiary which operates the existing units at Plant Vogtle) and Georgia Power is announced. June – Georgia Power enters a new agreement with Toshiba, the parent company of Westinghouse, affirming the value of Toshiba's guarantee at $3.68 billion. Parent guarantees were put in place to protect Georgia electric customers as part of the original contract for the project. July – The service agreement is finalized with Westinghouse which allows Southern Nuclear to oversee construction activities at the site. The scope of the service agreement includes engineering, procurement and licensing support from Westinghouse, as well as access to Westinghouse intellectual property needed for the project. 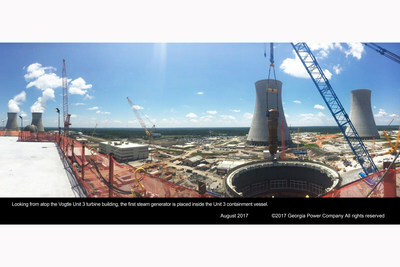 August – The first steam generator is placed for Vogtle Unit 3. The 1.4 million-pound steam generator marked the first major lift with Southern Nuclear in charge of oversight activities at the construction site. On August 31, Georgia Power filed a recommendation, supported by all of the other co-owners, to continue construction of the Vogtle project with the Georgia PSC. The recommendation was based on the results of a comprehensive schedule, cost-to-complete and cancellation assessment. September – Georgia Power announces a new agreement with the U.S. Department of Energy (DOE) for a conditional commitment of approximately $1.67 billion in additional loan guarantees. With a total of more than $5 billion in anticipated DOE loan guarantees, Georgia Power expects to be able to provide more than $500 million in present-value benefits to its customers. Major milestones at the construction site include the placement of the deaerator for Unit 4 and the Unit 3 steam generator. October – Georgia Power receives the first parent guarantee payment from Toshiba in the amount of $137 million. This payment was a positive indication of Toshiba's commitment to meeting its financial obligation to the company and customers. Major milestones at the construction site include a critical concrete 'super placement,' lasting 71 hours, for Unit 3 and the lift of the 237-ton CA03 module for Unit 4. November – Paul Bowers, chairman, president and CEO of Georgia Power, appears with the other co-owner CEOs at the Georgia PSC in support of the unified recommendation to move forward. Read Bowers' comments here. At the construction site, the last of the "Big 6" modules, the 52-ton CA02 module for Unit 4 is placed. December – Georgia Power announces a new agreement with Toshiba to receive all remaining scheduled payments from Toshiba in the amount of approximately $3.2 billion by Dec. 15, 2017. Georgia Power's proportionate share of the payments is approximately $1.47 billion with every dollar to be used to benefit customers. Receiving 100 percent of the funds owed by Toshiba will eliminate one of the greatest risks for continuing construction of the Vogtle project. To view all of the progress made this year, and since the beginning of construction, visit the Georgia Power YouTube Channel and view new photos added each month in the Plant Vogtle 3 & 4 Online Photo Gallery. The Georgia PSC is reviewing the recommendation to move forward filed on August 31 and is expected to make a decision regarding the future of the Vogtle 3 and 4 project as part of the 17th Vogtle Construction Monitoring (VCM) proceeding. Read the 17th VCM Report here. From the beginning of the Vogtle expansion, Georgia Power has worked to pursue all available benefits for customers and minimize the impact of the new units on electric bills. In addition to this month's announcement that the Vogtle co-owners have reached an agreement to receive 100 percent of parent guarantee funds available from Toshiba (approximately $3.2 billion) by Dec. 15, 2017, the company recently announced a conditional commitment of approximately $1.67 billion in additional loan guarantees for the project from the U.S. Department of Energy (DOE). Today, after including anticipated customer benefits from federal production tax credits, interest savings from loan guarantees from the DOE and the fuel savings of nuclear energy, the projected peak rate impact to Georgia Power retail customers is approximately 10 percent, with 5 percent related to the project already in rates – well below original projections of approximately 12 percent. Final approval and issuance of the additional loan guarantees by the DOE cannot be assured and are subject to the negotiation of definitive agreements, completion of due diligence by the DOE, receipt of any necessary regulatory approvals, and satisfaction of other conditions. Certain information contained in this communication is forward-looking information based on current expectations and plans that involve risks and uncertainties. Forward-looking information includes, among other things, statements concerning the new agreement with Toshiba, expected benefits of the DOE loan guarantees, expected rate impacts and other future actions related to Plant Vogtle Units 3 and 4. Georgia Power cautions that there are certain factors that could cause actual results to differ materially from the forward-looking information that has been provided. The reader is cautioned not to put undue reliance on this forward-looking information, which is not a guarantee of future performance and is subject to a number of uncertainties and other factors, many of which are outside the control of Georgia Power; accordingly, there can be no assurance that such suggested results will be realized. The following factors, in addition to those discussed in Georgia Power's Annual Report on Form 10-K for the year ended December 31, 2016, and subsequent securities filings, could cause actual results to differ materially from management expectations as suggested by such forward-looking information: the impact of any inability or other failure of Toshiba to perform its obligations under its guarantee and the new agreement; the impact of any failure to extend the in-service deadline for federal production tax credits; the impact of any failure to amend the DOE loan guarantee to allow for additional borrowings; state and federal rate regulations and the impact of pending and future rate cases and negotiations; the impact of recent and future federal and state regulatory changes, as well as changes in application of existing laws and regulations; current and future litigation, regulatory investigations, proceedings, or inquiries; available sources and costs of fuels; effects of inflation; the ability to control costs and avoid cost overruns during the development construction and operation of facilities, which include the development and construction of generating facilities with designs that have not been finalized or previously constructed; the ability to construct facilities in accordance with the requirements of permits and licenses, to satisfy any environmental performance standards and the requirements of tax credits and other incentives, and to integrate facilities into the Southern Company system upon completion of construction; advances in technology; legal proceedings and regulatory approvals and actions related to Plant Vogtle Units 3 and 4, including Georgia Public Service Commission approvals and Nuclear Regulatory Commission actions; interest rate fluctuations and financial market conditions and the results of financing efforts; changes in The Southern Company's or Georgia Power's credit ratings, including impacts on interest rates, access to capital markets, and collateral requirements; the impacts of any sovereign financial issues, including impacts on interest rates, access to capital markets, impacts on foreign currency exchange rates, counterparty performance, and the economy in general, as well as potential impacts on the benefits of DOE loan guarantees; and the effect of accounting pronouncements issued periodically by standard setting bodies. Georgia Power expressly disclaims any obligation to update any forward-looking information.